Amazon is one of the biggest ecommerce companies in Europe. Even while it’s not present in most European markets, its influence is huge. Especially in the United Kingdom and Germany, Amazon isn’t shy with launching new initiatives. 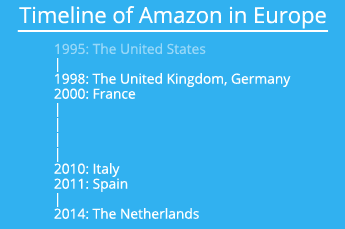 Here’s what Amazon is doing in Europe. Amazon launched its website in the US in 1995 and after three years it opened its digital doors in the United Kingdom and Germany. France followed in 2000. Ten years later, in November 2010, Amazon launched in Italy, while in 2011, Spain became the latest country in Europe where Amazon hosts a dedicated ecommerce website. The retailer also launched Amazon.nl in the Netherlands in 2014, but that website is different from the rest: the retailer only sells e-books and its Kindle e-reader through this website. In December of 2017, it became known that Amazon has plans to open physical stores in Germany, similar to the brick-and-mortar stores it already has in the US. Throughout Europe, Amazon has a network of 31 fulfillment centers, spread across seven countries. In April of 2017, Amazon announced it was seeking a total of 1,300 warehouse units near major cities across Europe, so they can function as last-mile centers. In 2015, the retail company shipped over 1 billion units to its customers across the continent. Amazon started as an online store, but now it also generates revenue with things like its hosting solution Amazon Web Services and its paid subscription service Amazon Prime. This service was announced in 2005: for an annual fee of 79 dollars, members were offered free two-day shipping and discounted one-day shipping rates. Two years later, Amazon Prime could also be used by customers in Germany and the United Kingdom, while France followed in 2008 and Italy in 2011. In the course of the years, Amazon Prime extended its membership benefits with services like Amazon Video, the Kindle Owners’ Lending Library, Prime Music and Amazon Drive. Amazon Prime Now was announced in December 2014 and gave Prime members the opportunity to have products delivered to them within one hour for 8 dollars or within two hours for free. 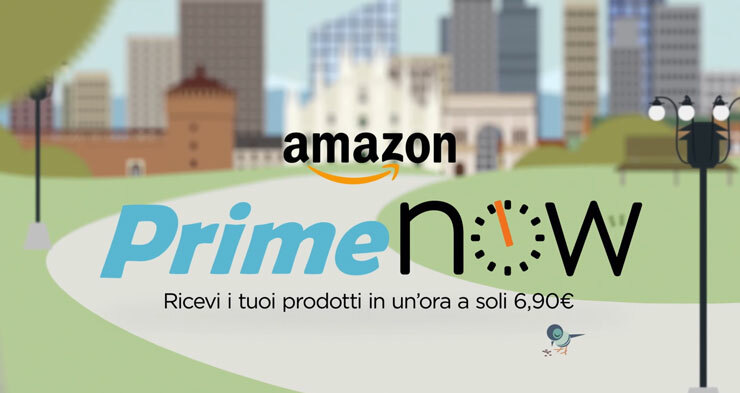 After it launched in the US, Amazon Prime Now has expanded to several cities in the UK, France, Italy and Spain. In March 2018, Amazon partnered with French grocery retailer Monoprix so it could deliver groceries to Prime Now customers in France. AmazonFresh is Amazon’s food delivery service which was launched in the US in 2007. The service is for Amazon Prime members and gives users the opportunity to order grocery items and have them delivered to their homes on the same day or the next day. It started with AmazonFresh in the United Kingdom in 2016, launching the service only in some postal code areas in London. One year later, AmazonFresh launched in Berlin, Potsdam and Hamburg. In April 2015, Amazon announced the launch of Amazon Business, a new marketplace dedicated to businesses. The service first started in the US and two years later, Amazon Business launched in the UK. This was the first European market where the B2B platform of Amazon was active. In 2016, Amazon Business launched in Germany and in 2018, the American company decided to roll out its business-to-business platform in the other major Amazon markets: Amazon Business launched in France, Italy and Spain. In Europe, Amazon has about 50,000 permanent employees working for them. Every year, when the holiday season is on its way, Amazon hires extra temporary staff to manage the warehouses, because this is always the busiest time of the year for Amazon and many other retailers. There has been quite some controversy regarding the treatment of workers. Mostly there was criticism towards the company’s warehouse conditions and employment practice. A couple of times, employees went on a strike to get a better salary and benefits. For example, in 2013, staff members of Amazon Germany went on a daylong strike a couple of times. Amazon is one of those key ecommerce players, many small and big retailers keep an eye on. If Amazon launches a certain service or decides to focus on a specific product category, the online retail industry knows about this in a split second. Most of Amazon’s decisions are met with a certain restraint, as Amazon has a big influence on the market, the competition and consumers. Niche players are afraid Amazon will one day enter their market and sweep them away with lower prices, better service and faster delivery. But Amazon is also one of those players that lead the ecommerce dance. If it starts offering a certain service (like faster delivery), many online retailers will soon follow, because they don’t want to lose more market share to Amazon.